Windy Hill launches new hoppy cider | Drink. Blog. Repeat. 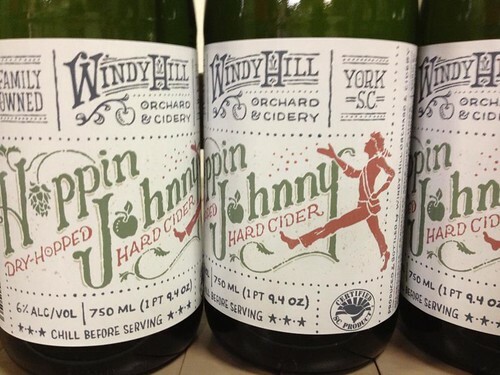 At the Beertopia festival in Fort Mill on Saturday, the Windy Hill Orchard and Cidery in York released Hoppin Johnny, a 6% dry-hopped hard cider. The hoppy cider was made with Stayman Winesap apples and dry-hopped with whole left hops grown at the cidery. It’s not clear what hops were used for the dry-hopping, but Willamette, Perle, Cascade, Saaz and others are grown on location. The cider is expected to hit Windy Hill’s markets this week. Very interesting. I wonder how the reception will be. Sounds like it’ll have a good hop aroma mixed with the cider sweetness. Curious as to which hop they used… Cascade would be ambitious for this one! Bryan, your thoughts are right on. It had a great smell, with Cascade being very prominent. I know Matt (from Windy Hill) said Cascade, Saaz and one other hop that I can’t remember were used. You get more of the hop character in the aroma, but it’s there in the taste, too. Don’t expect any bitterness whatsoever, but it has some nice floral and citrus notes. I really enjoyed it and their other offerings.